I’ve met Creole Wild West Chief Howard Miller through my client and good friend, musician June Victory. Chief Howard is a very nice, talented guy who deserves all he can achieve through his art as a Mardi Gras Indian Chief. Recently he’s filed an online copyright application for his brand new Indian costume in the hopes of collecting some of the income derived from photos, posters, T-Shirts, videos and movies of his costume. 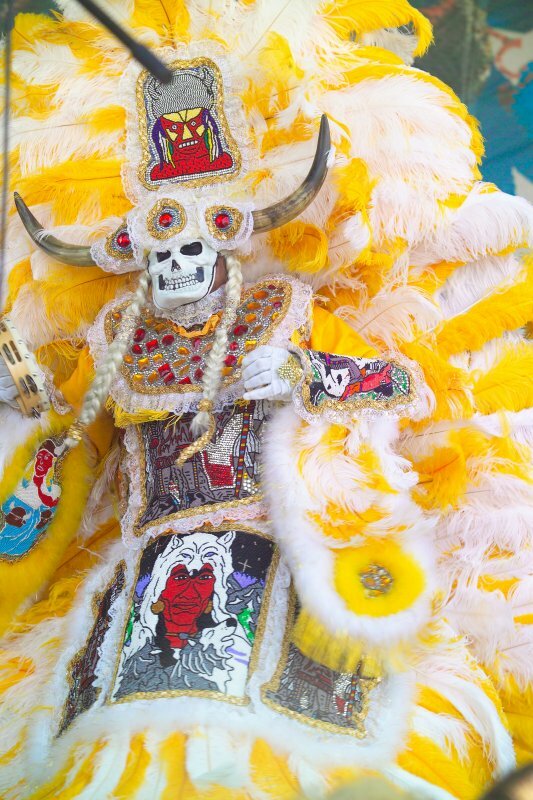 Chief Howard Miller knows cameras will start clicking next month when his Creole Wild West Mardi Gras Indians take to the streets with their elaborately beaded and feathered costumes. “It’s not about people taking pictures for themselves, but a lot of times people take pictures and sell them,” Miller said. Intellectual property law dating back to the nation’s founding dictates that apparel and costumes cannot be copyrighted, but Tulane University adjunct law professor Ashlye Keaton has found a way around that by classifying them as something else. Keaton got to know many of the Indians through another Tulane program, the Entertainment Law Legal Assistance Project. She was intrigued by their art, more so after she saw photos sold at the New Orleans Jazz and Heritage Festival and at local galleries, apparently without their permission. Pictures of the Indians sell online for up to $500 each, and books and T-shirts are also available. Now they and members of the city’s other tribes are working to get a slice of the profits when photos of the towering outfits they have spent the year crafting end up in books and on posters and T-shirts. Once the costumes are copyrighted, which can be done online for $40, the Indians can either sue people who sell photos of them or try to negotiate licensing fees with photographers either before or after the pictures are taken. Intellectual property law dating back to the nation’s founding dictates that apparel and costumes cannot be copyrighted, but Tulane University adjunct law professor Ashlye Keaton has found a way around that by classifying them as something else- as works of art. The first test for the Indians who have copyrighted the new costumes they will wear this year will come at Mardi Gras. The Indians revamp or completely remake their suits every year, and the copyright takes effect at the first public showing, said Ryan Vacca, an assistant professor of law at the University of Akron School of Law. “They would be in a good position to negotiate a flat fee or percentage of the sale, something like that,” said Vacca said. The Mardi Gras Indians have a long and colorful history in New Orleans. Since the end of the 19th century, black men have been making their own version of Indian dress and banding together for informal street parading at Mardi Gras. Local lore holds the tradition sprouted from runaway slaves’ admiration for Native Americans who harbored them from slave hunters before the Civil War. Mostly the Mardi Gras Indians come from working-class neighborhoods, so their costume investment can take up much of their disposable income. There is no accurate count of the groups, but about 35 are believed active, many with colorful names such as the Wild Tchoupitoulas, Black Seminoles, Golden Arrows, Wild Magnolias, Fi-Yi-Yi, 7th Ward Hard Head Hunters Golden Blades and Creole Osceola. Each is led by a chief. Each Indian makes a new suit every year, and over the decades they have become much more glitzy and elaborate. Some cost thousands of dollars. 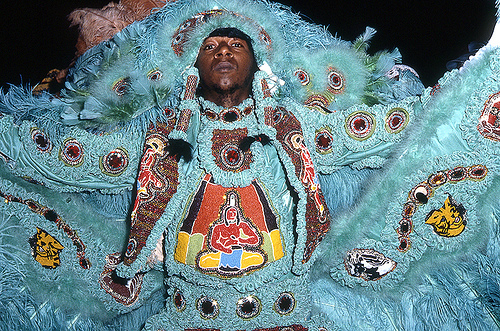 Miller copyrighted his costume at Keaton’s urging, but it’s unclear how many other Mardi Gras Indians have, since the process has only recently been available online and tracking the old applications is difficult. Miller said he expects many more Indians to copyright their work now that several have done it and can provide help. He hopes having the copyright will be enough and he will be able to negotiate with photographers and others using his image, rather than sue. This entry was posted by NewOrleansMusicMan on February 8, 2011 at 4:42 pm, and is filed under Carnival, Carnival New Orleans, French Quarter, Mardi Gras, Mardi Gras Indians, Mardi Gras Music, Mardi Gras Parade, Music, New Orleans Carnival. Follow any responses to this post through RSS 2.0. You can leave a response or trackback from your own site.